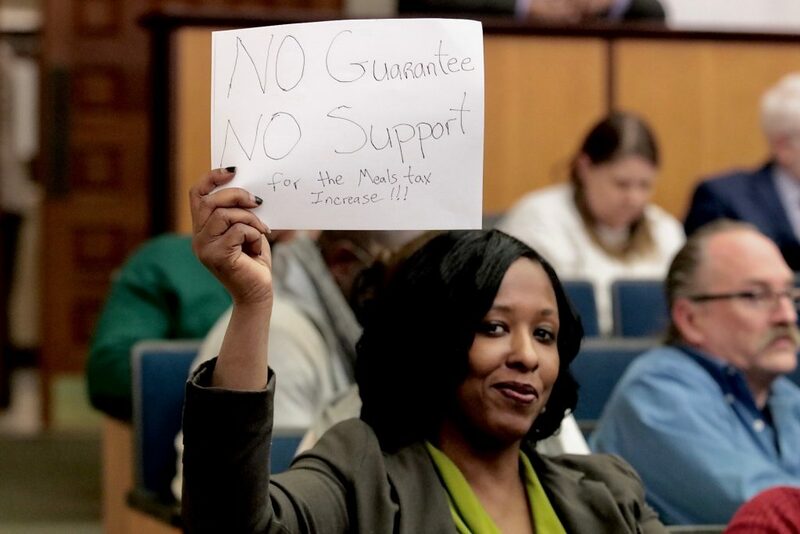 Opponents and proponents squared off last night at the Organizational Development Committee, the only committee meeting to take public comments on Mayor Levar Stoney’s controversial proposal to raise the meal taxes. 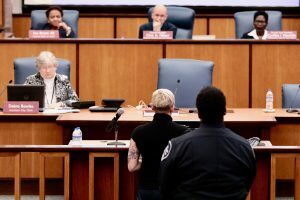 While the rhetoric over the proposal has become quite contentious, especially online, the mood at City Council was congenial if not somewhat emotional, with people on both sides of the issue respectfully stating their case. Part of the confusion over the proposed tax has been where money can be collected from. Rose sought to clarify this, explaining why it cannot be collected from sectors like the hospitality industry. “When we say available, you’ll notice that the lodging tax is not available,” he said, stating that those revenues are dedicated to debt repayment for things like the Greater Richmond Convention Center. Another of the counter-arguments made against the city’s proposal has been the suggestion that property taxes should be raised, which was also addressed by Rose. “For example, personal property tax for real estate is 100 percent born by city residents like you and I,” said Rose, explaining that the meals tax is shared by tourists and people coming in from the counties and not solely shared by residents, “from the confines of the city.” He finished by explaining that Virginia is limited by its lack of income tax to bond off of – citing Cincinnati, Ohio as an example of a city that has the kind of bonding capacity that the Commonwealth lacks to raise revenues. 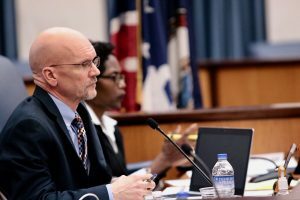 Stoney’s proposal will raise Richmond’s meal tax 1.5 percent, which would raise the current tax to 7.5 percent, and when combined with the state sales tax would total 12.8 percent. The meal’s tax was increased in 2003, from 5 to 6 percent to help pay for the Centerstage Theatre. Upon completion of the theatre the tax was supposed to be rescinded, however, it was made permanent in 2006 to pay for “operational costs” to Richmond’s general fund – a long-standing grievance cited by the restaurant community. After the city completed its presentation, the floor was opened for both sides to make comments. Each side had 30 minutes to highlight their perspective with each speaker being given three minutes to state their case. 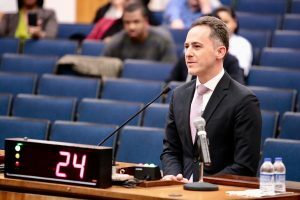 After some initial confusion over whose turn it was to speak, including a school board member and the new school board superintendent, Jason Kamras, Richmond restauranteurs made their case. Referencing the first meals tax hike, Conway voiced her concerns on trusting the city to allocate all of the funds to Richmond schools. “The meals tax has been used before to raise funds that have not gone to the project in which they were intended. The 2003 hike was one such example which was supposed to sunset after a year…there is no guarantee that all funds from this tax hike will go to RPS,” she said. 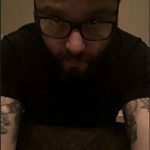 The restaurant community has been one of the most vocal critics of Stoney’s proposal, citing a potential loss of business, the previous tax hike, and an inevitable shift of cost to customers, all of which is targeting their industry uniquely. “We’ve been through a lot lately, the downtown restaurants…when taxes go up people don’t come out as often,” said Liz Kinkaid who spoke on behalf of the restaurant group that owns Little Saint, Tarrant’s, and Max’s on Broad. In addition to the potential consequences of the meals tax, she also cited construction of The Pulse along Broad Street as a factor in declining business, citing a 5 percent drop in sales. “When sales go down, waitresses can’t make their mortgages, people can’t make rent. When taxes go up in the city, we feel that,” she said. Kinkaid wrapped up by voicing her support for rehabilitating schools, but urged the city to seek out an alternative to another meals tax increase. “I know we need money for schools, we all know that. We would ask that you take the same six months to really look for a better plan. When I go apply for an awning permit it took six months, so I don’t understand why in just a few weeks we can roll out a whole new tax program,” she said. Ultimately, the committee voted to take the proposal for full approval at next week’s council meeting. The recommendation was supported by Councilpersons Addison, Hilbert, Robertson, Newbille, and Jones, while the other members sought to slow down the process in order to meet with constituents. Nonetheless, in a Facebook post after the vote, Stoney said, “Tonight’s vote was a recognition that we shouldn’t delay in getting our kids the schools they deserve.” Regardless of the outcome, the meals tax will continue to prove divisive and has set the stage for a wider conversation on how to best administer the critical needs of the River City.